It is well known that allosteric modulators of muscarinic acetylcholine receptors can both diminish and increase the affinity of receptors for their antagonists. We investigated whether the allosteric modulators can also increase the affinity of receptors for their agonists. Twelve agonists and five allosteric modulators were tested in experiments on membranes of CHO cells that had been stably transfected with genes for the M1–M4 receptor subtypes. Allosterically induced changes in the affinities for agonists were computed from changes in the ability of a fixed concentration of each agonist to compete with [3H]N-methylscopolamine for the binding to the receptors in the absence and the presence of varying concentrations of allosteric modulators. The effects of allosteric modulators varied greatly depending on the agonists and the subtypes of receptors. The affinity for acetylcholine was augmented by (−)-eburnamonine on the M2 and M4 receptors and by brucine on the M1 and M3 receptors. Brucine also enhanced the affinities for carbachol, bethanechol, furmethide, methylfurmethide, pilocarpine, 3-(3-pentylthio-1,2,5-thiadiazol-4-yl)-1,2,5,6-tetrahydro-1-methylpyridine (pentylthio-TZTP), oxotremorine-M, and McN-A-343 on the M1, M3, and M4 receptors, for pentylthio-TZTP on the M2 receptors, and for arecoline on the M3receptors. (−)-Eburnamonine enhanced the affinities for carbachol, bethanechol, furmethide, methylfurmethide, pentylthio-TZTP, pilocarpine, oxotremorine and oxotremorine-M on the M2receptors and for pilocarpine on the M4 receptors. Vincamine, strychnine, and alcuronium displayed fewer positive allosteric interactions with the agonists, but each allosteric modulator displayed positive cooperativity with at least one agonist on at least one muscarinic receptor subtype. The highest degrees of positive cooperativity were observed between (−)-eburnamonine and pilocarpine and (−)-eburnamonine and oxotremorine-M on the M2 receptors (25- and 7-fold increases in affinity, respectively) and between brucine and pentylthio-TZTP on the M2 and brucine and carbachol on the M1receptors (8-fold increases in affinity). The discovery that it is possible to increase the affinity of muscarinic receptors for their agonists by allosteric modulators offers a new way to subtype-specific pharmacological enhancement of transmission at cholinergic (muscarinic) synapses. It has long been known that the affinity of muscarinic receptors for their agonists and antagonists can be diminished by compounds acting allosterically (for reviews, see Refs. 1-3). It was discovered, however, that the affinity of cardiac muscarinic receptors for the muscarinic antagonist NMS can be increased by the neuromuscular blocker alcuronium (4, 5). Subsequently, it was shown that the positive allosteric action of alcuronium on the binding of NMS is specific for the M2 and M4 muscarinic receptor subtypes (Ref. 6, but see Refs. 7 and 8 for conflicting data concerning the M3 and M4 subtypes) and that it also applies to the binding of atropine, N-methylpiperidinyl benzilate, and several other muscarinic antagonists (9, 10). Other compounds exerting positive allosteric effects on the binding of muscarinic antagonists were discovered recently, such as strychnine (11, 12), (−)-eburnamonine (13), fangicholine and tetrandrine (7), and 9-methoxy-α-lapachone (8). It is obvious that it is important to know whether the allosteric modulators are also able to increase the affinity of muscarinic receptors for their agonists. We investigated the effects of alcuronium and four compounds with structural similarities to alcuronium (strychnine, brucine, vincamine, and (−)-eburnamonine) on the affinities of muscarinic receptors of the M1–M4 subtypes for acetylcholine and 11 other agonists. We discovered that the affinities for the agonists can be allosterically enhanced by most of the compounds tested, although the direction of the allosteric interaction (positive or negative) and its extent vary depending on receptor subtype and the nature of the agonist and allosteric modulator. To measure the affinities of receptors for the unlabeled agonists tested, we used a procedure devised by Proöka (10)1 in which the allosterically induced changes in the affinity for the agonist are reflected by changes in the binding of a labeled classic antagonist ([3H]NMS), which can be easily determined by the filtration method. [3H]NMS (80 Ci/mmol) was from DuPont-New England Nuclear (Dreieich, Germany). Arecaidine propargyl ester was from Cookson Chemicals (Southampton, UK). Acetylcholine iodide, arecoline, bethanechol, brucine, carbachol, (−)-eburnamonine, furmethide, methylfurmethide, oxotremorine, pilocarpine, strychnine, and vincamine were from Sigma Chemical (St. Louis, MO). McN-A-343 and oxotremorine-M were from Research Biochemicals (Natick, MA). Alcuronium was kindly provided by Hoffmann-La Roche (Basel, Switzerland), and pentylthio-TZTP was provided by Dr. P. Sauerberg (Copenhagen, Denmark). Pentylthio-TZTP is a thio analogue of the M1-selective muscarinic agonist xanomeline (14-16). Experiments were performed on membranes of CHO cell lines stably transfected with human genes for individual M1–M4 subtypes of muscarinic receptors (17). Cells were grown as described (6) in plastic dishes without coating in Dulbecco’s modified Eagle’s medium with 10% fetal calf serum and 0.005% geneticin. Seven days after subculturing, they were released by mild trypsinization, suspended in Dulbecco’s modified Eagle’s medium, and centrifuged for 3 min at 300 × g. The sedimented cells were resuspended in homogenization medium composed of 136 mm NaCl, 5 mm KCl, 1 mmMgSO4, 1 mm Na-phosphate buffer, pH 7.4, and 10 mm Na-HEPES buffer, pH 7.4. They were washed twice through centrifugation (3 min at 300 × g) and resuspension in fresh homogenization medium and then homogenized with an Ultra-Turrax homogenizer (Janke and Kunkel, Staufen, Germany). The homogenate was centrifuged for 10 min at 600 × g, and the sediment was resuspended and recentrifuged. The supernatants from this and the previous centrifugation (containing the cell membranes) were combined, and their concentration was adjusted to correspond to 10 million cells of the starting suspension/1 ml. Then, they were kept frozen at −20°. On the day of the experiment, they were thawed and centrifuged for 15 min at 60,000 × g; the sediment was washed twice through resuspension in the homogenization medium and recentrifugation. Radioligand binding and its changes in the presence of competitive and allosteric ligands were examined essentially as previously described (6, 18-20). Membranes corresponding to 600,000 cells were incubated at 25° in a final volume of 0.8 ml for the time periods indicated below. The composition of the incubation medium corresponded with that of the homogenization medium, supplemented with 0.5 mm GTP in all binding experiments and with the ligands as indicated; GTP was included to induce the dissociation of G proteins from receptors. The incubation was terminated by filtration on Whatman GF/C glass-fiber filters in a Brandel cell harvester. Four types of radioligand binding experiments were performed: (a) Saturation binding experiments were performed with [3H]NMS to determine the K d(K X) and B max for its binding. Membranes were incubated with 17- 600 pm[3H]NMS for 22 hr. 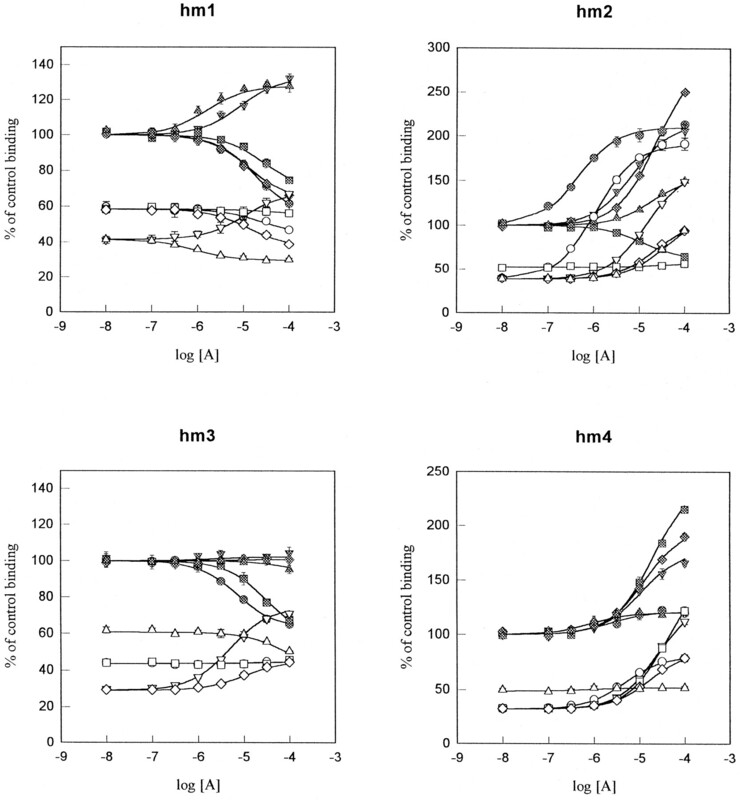 (b) Competition-type experiments were performed with agonists in which membranes were incubated with a fixed concentration of [3H]NMS (50 or 200 pm) and with various concentrations of agonists to determine their IC50, K d(K L), and Hill slope factor (n H) values. Membranes were incubated first with [3H]NMS alone for 1 hr and then with [3H]NMS plus the agonist for 21 hr. (c) Competition-type experiments were performed with the allosteric ligands in which membranes were incubated with a fixed concentration of [3H]NMS and with various concentrations of an allosteric ligand to determine the K d value for the binding of the allosteric ligand (K A) and the cooperativity coefficient α (21), which describes the allosteric interaction between the binding of the allosteric ligand and [3H]NMS. Membranes were incubated first with [3H]NMS alone for 0.5 hr and then with the addition of the allosteric ligand; the incubation was continued for additional 21 hr. The rationale for the initial incubation with [3H]NMS alone is that equilibrium binding is achieved faster with such an arrangement because the binding of orthosteric ligands is very slow in the presence of allosteric ligands (18). The concentration of [3H]NMS used was 50 pm if the cooperativity between NMS and the allosteric ligand was positive on the investigated receptor subtype and 200 pm if it was negative. (D) Competition-type experiments were performed with the allosteric ligands in which membranes were incubated with a fixed concentration of [3H]NMS (50 or 200 pm; see C) in the presence of a fixed concentration of an agonist and of various concentrations of allosteric ligands. The concentration of the agonist was chosen to diminish the binding of [3H]NMS (in the absence of the allosteric ligand) by ∼50%. Membranes were incubated first with [3H]NMS alone for 0.5 hr; next, the agonist was added for 0.5 hr, and finally alcuronium was included, and the incubation was continued for additional 21 hr. The B max andK d values for the binding of [3H]NMS (K X) and theK d values for the binding of agonists (K L) and the allosteric modulators (K A), as well as the Hill slope factors (n H) for the competition between the agonists and [3H]NMS and the coefficient of cooperativity between [3H]NMS and the allosteric modulators [α; determined and used as proposed by Ehlert (21)], were computed by nonlinear regression as previously described (6, 18, 19). Allosteric interaction between the binding of the allosteric ligands (A) and the unlabeled agonists (L) was evaluated from changes in the binding of [3H]NMS occurring in the presence of a fixed concentration of the agonist and of increasing concentrations of the allosteric ligand; it was characterized by the cooperativity coefficient β. The cooperativity coefficient β is analogous to Ehlert’s (21) coefficient α and corresponds to the ratio of theK d value for the binding of an agonist to receptors occupied by the allosteric ligand and theK d value for the binding of the same agonist to free receptors. Correspondingly, β < 1 in the case of positive cooperativity and β > 1 in the case of negative cooperativity between the allosteric ligand and the agonist. In the current study, we reserve the use of the coefficient α for the description of the cooperativity between the allosteric agents and the radiolabeled marker substance [3H]NMS. The value of β was computed according to eq. 3 [modified from Proška (10)2] and based on the principles elaborated by Ehlert (21). In the equations that follow, [3H]NMS is denoted as X, and radioligand binding in the presence of [X], [A], and [L] is denoted asB XAL, whereas the binding occurring in the absence of A and L is denoted as B X:BX=[X]×Bmax[X]+KX Equation 1 BXAL=[X]×Bmax[X]+KX×[L](KA+[A]/β)+KL(KA+[A])KL(KA+[A]/α) Equation 2and the ratio between the binding of [3H]NMS in the presence of [A] and [L] and in the absence of A and L equals:BXALBX=[X]+KX[X]+KX×[L](KA+[A]/β)+KL(KA+[A])KL(KA+[A]/α) Equation 3Eq. 3 was fitted to data on [3H]NMS binding in the presence of a fixed concentration of L and of increasing concentrations of the allosteric ligand, obtained in experiments described under category D. (K X was determined in experiments of type A, K L was determined in experiments of type B, and K A and α were determined in experiments of type C; this way, β was the single unknown parameter in eq. 3). Saturation binding experiments with [3H]NMS. K d values for [3H]NMS binding to the M1–M4 receptor subtypes varied in the range of 103–148 pm, and B maxvalues were in the range of 85–143 fmol/106 cells. A summary of the data is provided in Table 1. Binding competition between agonists and [3H]NMS. Affinities of agonists for the M1–M4 receptor subtypes were determined according to the ability of the agonist to inhibit [3H]NMS binding in the presence of 0.5 mmGTP; in this way, the low affinity binding of agonists was measured. The computed pK i and n Hvalues are summarized in Table 2. The Hill slopes were not significantly different from unity for any agonist. The affinities of acetylcholine and its analogues bethanechol and carbachol were in the range of 29–98 μm; those of furmethide and methylfurmethide were in the range of 12–78 μm; those of arecoline and arecaidine propargyl ester were in the range of 0.4–5.8 μm; those of oxotremorine and its derivatives (oxotremorine M and McN-A-343) were in the range of 3.3–17.0 μm; and those of pilocarpine were in the range of 6–12 μm. Pentylthio-TZTP displayed affinities in the range of 2–12 nm and was the only agonist with marked subtype selectivity (M1/M2 = 5.4, M4/M2 = 6.5). The M1/M2selectivity of arecaidine propargyl ester was 4.4-fold, whereas all the other differences in the affinities for individual subtypes (including those concerning McN-A-343) were <3-fold. Effects of allosteric ligands on the binding of [3H]NMS. Five allosteric ligands were investigated, and all of them have been found to have both positive and negative effects on the binding of [3H]NMS, depending on individual muscarinic receptor subtypes. These effects are shown (see Fig. 2, filled symbols), and the computedK A and α values are summarized in Table3. Increases in the binding of [3H]NMS were found with alcuronium and (−)-eburnamonine on the M2and M4 subtypes; with strychnine and brucine on the M1, M2, and M4 subtypes; and with vincamine on the M4 subtype. [3H]NMS binding to membranes of CHO cells expressing the human m1–4 (hm1–4) muscarinic receptor genes and incubated in the presence of increasing concentrations of the allosteric ligands alcuronium (•, ○), strychnine (▾, ▿), brucine (▴, ▵]), vincamine (▪, □), or eburnamonine (♦, ⋄) and in the absence (filled symbols) or presence (open symbols) of acetylcholine. Abscissa, log10 of the concentration (m) of the allosteric ligand.Ordinate, [3H]NMS binding expressed as percent of the binding in the absence of acetylcholine and the allosteric ligands. The concentration of [3H]NMS was as described in the text. The concentration of acetylcholine was 100 μm in experiments with the M1 and M2 receptor subtypes and 50 μm in experiments with the M3 and M4 receptor subtypes. Symbols are mean ± standard error of three or four experiments, with incubations performed in triplicates. Curves, correspondence to eq. 3. Computed from these curves were the β coefficients describing the allosteric interactions between acetylcholine and the allosteric ligands; they have been listed in Table 4. The differences (indicated by >) were statistically significant when evaluated by Student’s t test. Systematic correlation between the affinity (K A) for a certain receptor subtype and the direction of the allosteric effect (positive or negative) was not apparent. [3H]NMS binding in the simultaneous presence of an agonist and an allosteric modulator: Model binding curves. Fig.1 shows simulated curves describing the expected changes in the binding of [3H]NMS in the presence of a fixed concentration of the orthosteric ligand L and of varying concentrations of the allosteric ligand A, provided there is positive cooperativity between the binding of [3H]NMS and A (α = 0.1; Fig. 1A) or negative cooperativity (α = 10; Fig. 1B) and the cooperativity between the binding of L and A is positive (β = 0.1), absent (β = 1.0), or negative (β = 10). K NMS was taken as equal to 100 pm, K A andK L as equal to 1 μm, and the concentration of L as equal to K L. The continuous curves have been computed according to eq. 3. The dashed curves represent the model of [3H]NMS binding described by eq. 4, which assumes that the binding of L to the orthosteric site sterically prevents the binding of A to the allosteric site and that the binding of A to the allosteric site sterically prevents the binding of L to the orthosteric site. Binding of [3H]NMS in the presence of an allosteric ligand A at the concentrations (abscissa) and in the presence (open symbols) or absence (filled symbols) of an unlabeled orthosteric ligand L at a fixed concentration. Continuous curves, correspondence to eq. 3. Dotted curves, correspondence to eq. 4. The assumptions were (a) the cooperativity between A and [3H]NMS is either positive (α = 0.1;left) or negative (α = 10; right), (b) the concentration of [3H]NMS corresponds toK NMS and equals 100 pm, (c) the cooperativity between A and L is either positive (β = 0.1), neutral (β = 1), or negative (β = 10 or 100); values of β are indicated near the curves, (d) the concentration of L is 1 μm and equals K L, (e) K A= 1 μm, and (e) the binding of L to the orthosteric binding site prevents the binding of A to the allosteric binding site, and vice versa (squares and dotted lines).Abscissa, log10 of the concentration of A (m). Ordinate, [3H]NMS binding expressed as percent of the binding in the absence of A and L.
[3H]NMS binding in the simultaneous presence of an agonist and an allosteric modulator: Actual measurements. To illustrate the type of data obtained when [3H]NMS binding was measured in the presence of varying concentrations of the allosteric ligand alone or in the presence of varying concentrations of the allosteric ligand and of a fixed concentration of an agonist, Fig.2 shows the results of experiments with [3H]NMS binding to the M1–M4receptors in the absence or presence of acetylcholine and in the presence of varying concentrations of alcuronium, strychnine, (−)-eburnamonine, vincamine, and brucine. Experiments of the type shown in Fig. 2 permitted us to evaluate the allosteric interaction between the unlabeled allosteric ligand and the unlabeled agonist. This was done by fitting eq. (3) to the data obtained. Values of the cooperativity coefficients β are summarized in Table4. It is apparent from the data shown in Table 4 that both positive and negative allosteric interactions occurred between the agonists and the modulators examined. The direction of the interactions and their extent varied depending on the agonist, modulator, and subtype of the receptor. Of the 12 agonists tested, 11 displayed an increase in affinity by at least one third (β < 0.66) with at least one allosteric ligand on at least one receptor subtype. The single exception was arecaidine propargyl ester, which displayed only marginal positive cooperativity (β = 0.88) with (−)-eburnamonine on the M4 receptor subtype. It is also noteworthy that all allosteric ligands tested displayed positive cooperativity with at least one agonist on at least one receptor subtype. If we consider only those interactions in which β < 0.85, then alcuronium displayed positive cooperativity with only one agonist (pilocarpine) on only one receptor subtype (M2). Strychnine displayed positive cooperativity with three agonists, vincamine with four agonists, (−)-eburnamonine with nine agonists, and brucine with 10 agonists. The highest degrees of positive cooperativity were those observed between (−)-eburnamonine and pilocapine on M2 receptors (β = 0.04, indicating a 25-fold increase in affinity), brucine and pentylthio-TZTP on M2 receptors (β = 0.13), brucine and carbachol on M1 receptors (β = 0.13), and (−)-eburnamonine and oxotremorine-M on M2receptors (β = 0.15). Eq. 3 could not be fitted to data obtained in experiments with alcuronium and the agonists oxotremorine, oxotremorine-M, and McN-A-343 on the M1, M2, and M4 receptors, making calculations of β values impossible. Apparently, these three agonists interact with alcuronium and the receptors in a way different from that anticipated by eq. (3). As an explanation, we considered the possibility that the binding of these three agonists to the orthosteric binding site and of alcuronium to the allosteric binding site is mutually exclusive, presumably for steric reasons. If this were so, the system at equilibrium should conform to eq. 4. Fig. 3shows that there is indeed a good fit between the data measured in experiments and the curves obeying eq. 4. The sums of squares of differences were lower with eq. 4 than with eq. 3, but the difference was significant only at the M2 receptor (Ftest). 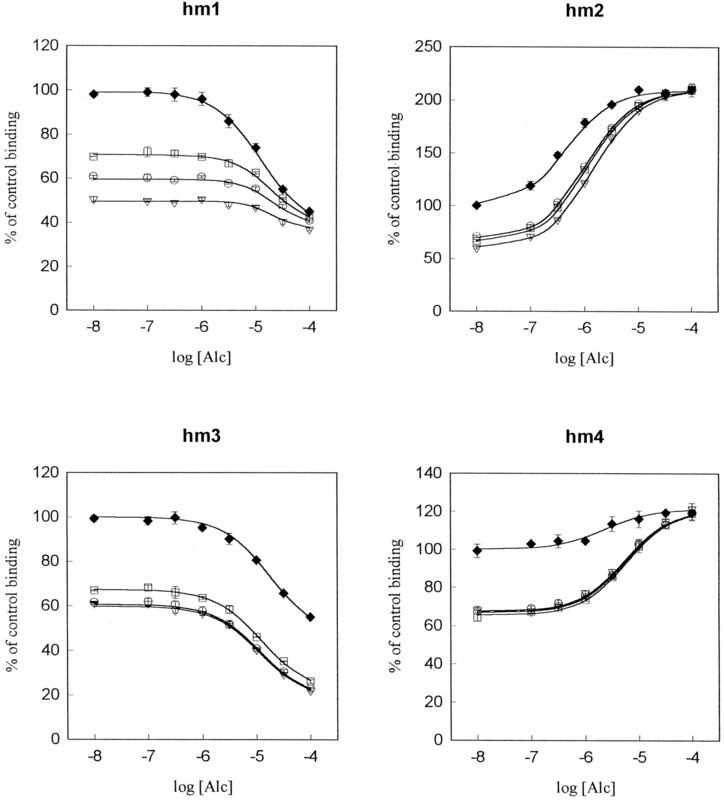 [3H]NMS binding to membranes of CHO cells expressing the human m1–4 (hm1–4) muscarinic receptor genes and incubated in the presence of increasing concentrations of alcuronium (Alc) and a stable concentration of muscarinic agonists McN-A-343 (○), oxotremorine (□), or oxotremorine-M (▿) or in the absence of any agonist (♦). The concentrations of [3H]NMS were as indicated in the text. The concentrations of agonists used in experiments on the M1, M3, and M4 subtypes were 8, 5, and 5 μm for McN-A-343, oxotremorine, and oxotremorine-M, respectively. On the M2 subtype, the respective concentrations were 10, 8, and 8 μm. Symbols are mean ± standard error of four experiments with incubations in triplicates. Abscissa, log10 of the concentration of alcuronium. Ordinate, [3H]NMS binding expressed as percent of the binding in the absence of alcuronium and agonists. The curves for the binding in the presence of agonists correspond to eq. 4, assuming that simultaneous binding of alcuronium to the allosteric site and of oxotremorine, oxotremorine-M, and McN-A-343 to the orthosteric site is not possible for steric reasons on the M1, M3, and M4 receptor subtypes. The main finding of the current study consists in the discovery of positive effects of allosteric modulators on the affinity of muscarinic receptors for muscarinic agonists, including acetylcholine. Only negative effects of allosteric modulators on the affinities of muscarinic receptors for agonists have been reported (22-25). The discovery is important for several reasons: (a) It suggests that drugs may be developed with the potential for increasing the efficiency of cholinergic (muscarinic) synaptic transmission in a very physiological way, by enhancing the sensitivity of postsynaptic receptors toward their natural agonist. (b) It points to a new way to achieve subtype- and tissue-specific activation of muscarinic receptors. Although the subtype selectivity of most muscarinic agonists is low, suitable allosteric modulators should permit the selective enhancement of the effect of a nonselective muscarinic agonist on a single receptor subtype and suppression of it on the other receptor subtypes (e.g., (−)-eburnamonine-induced changes in the affinities for acetylcholine). (c) The enhancement of synaptic transmission by allosteric modulators is likely to be extremely safe and completely activity dependent. The effects of allosteric ligands have clear-cut inherent pharmacodynamic limits because they alter the K d values for agonists and antagonists within a defined range. This should help to avoid receptor overstimulation (by allosteric enhancers) and overinhibition (by allosteric inhibitors). It is also important that the allosteric enhancers will act only when the presynaptic nerve terminal is active and the neurotransmitter is released, because they must bind to receptors simultaneously with the neurotransmitter to have an effect (26, 27). The question of whether allosteric enhancers will affect receptor desensitization requires specific investigation. Literature on the negative allosteric effects of neuromuscular blockers on muscarinic receptors (28) suggests that the M2 receptor subtype is most prone to allosteric modulation. Observations that the allosteric enhancement of the binding of NMS by alcuronium (4, 5, 7, 8) and strychnine (11, 12) is strongest on the M2 receptors and that alcuronium has the highest affinity for the M2 receptors (6) led to anticipation that the positive allosteric effects on the binding of agonists would also mainly occur on the M2 receptor subtype. The present data do not support such expectation. Allosteric enhancement of agonist binding could be revealed on all four receptor subtypes examined. The affinity for the physiological agonist acetylcholine was allosterically enhanced on the M1 and M3 subtypes by brucine and on the M2 and M4 subtypes by (−)-eburnamonine. Affinity for the allosteric modulator. In the membranes of transfected CHO cells, the values of K d for the binding of alcuronium to muscarinic receptor subtypes were 9.33, 0.62, 1.56, 1.31, and 22.0 μm on the M1, M2, M3, M4 and M5, receptor subtypes, respectively (6), and the cooperativity between alcuronium and NMS was positive on the M2 and M4 and negative on the M1, M3, and M5 subtypes. These data suggested that the effects of an allosteric ligand might be generally positive on those receptor subtypes with which the ligand associates with a high affinity. Inspection of Tables 3 and 4 indicates, however, that such generalization is not substantiated by data obtained with the other allosteric modulators, neither in relation to their cooperativity with the antagonist NMS nor in relation to their cooperativity with the agonists. Although strychnine had the highest affinity for the M3 receptors, its cooperativity with [3H]NMS binding was positive on the M1, M2, and M4 receptors. Similarly, positive cooperativity between (−)-eburnamonine and [3H]NMS was observed on the two receptor subtypes for which the affinity of (−)-eburnamonine was the lowest. No generally valid correlation is evident between the rank orders of the affinities of allosteric modulators for receptors and the rank orders of the β factors computed for their interactions with individual agonists. For example, brucine has a 100-fold higher affinity for the M4 than for the M3 subtype, but its cooperativity with most agonists is similar on both subtypes. This factor is difficult to consider with the current data because the experiments were performed in the presence of 0.5 mm GTP, which eliminated the high affinity binding of agonists. Under these conditions, no consistent correlation is apparent between the K L values of agonists in Table 2 and the relevant cooperativity factors β in Table 4. For complete analysis, it will be necessary to explore the cooperativity between agonists and allosteric modulators under conditions in which the receptor/G protein coupling occurs in a normal way, but this will be demanding in view of the complexity of the system and of recent data indicating that the allosteric modulators themselves modify the receptor/G protein interactions (29). We do not know of any published data indicating that that the allosteric modulators potentiate the functional responses to muscarinic agonists. We hope, however, that our data on the positive allosteric effects on agonist binding, as summarized in Table 4, will facilitate the discovery of positive modulations of functional responses to agonists. As noted in Results, data on the binding of [3H]NMS to the M1, M2, and M4 receptor subtypes in the simultaneous presence of alcuronium and oxotremorine, oxotremorine-M, or McN-A-343 seemed incompatible with eq. 3 and thereby with the assumptions on which it had been derived. This problem did not arise when the three agonists were present simultaneously with strychnine, brucine, vincamine, or (−)-eburnamonine. In attempts to explain this, we considered the possibility that alcuronium cannot bind to the allosteric site when the orthosteric site is occupied by oxotremorine, oxotremorine-M, or McN-A-343, and vice versa. If this were so, the binding of [3H]NMS should correspond to eq.4. We have found that the correspondence between the data and eq. 4 was indeed better than that between the data and eq. 3 (significantly better in the case of M2 receptors), which supports the hypothesis but does not prove it. Experimental examination of this point will be facilitated when radiolabeled allosteric modulators become available. In conclusion, we found that the affinity of muscarinic receptors for acetylcholine and pharmacological agonists may be increased by allosteric modulators and that the effect of the modulators is highly subtype selective. Using allosteric modulators, it may become possible to achieve subtype-selective stimulation of muscarinic receptors by acetylcholine and other subtype-nonselective agonists. We thank Dr. T. Bonner and Dr. M. Brann for stably transfected CHO cell lines. While this article was in press, an article appeared that described positive allosteric effect of brucine and its two derivatives on the binding of acetylcholine to muscarinic receptors [Birdsall, N.J.M., T. Farries, P. Charagozloo, S. Kobayashi, D. Kuonen, S. Lazareno, A. Popham, M. Sugimoto. Life. Sci. 60:1047–1052 (1997)]. ↵1 J. Proška and S. Tuček, manuscript in preparation. ↵2 J. Proška and S. Tuček, manuscript in preparation. This work was supported by Grant 309/96/1287 from the Grant Agency of the Czech Republic (S.T.) and National Institutes of Health Fogarty International Research Collaboration Award 2-R03-TW00171–04 (E.E.E.). (1989) Allosteric interactions of muscarinic receptors and their regulation by other membrane proteins. in The Muscarinic Receptors, ed Brown J. H. (Humana Press, Clifton, NJ), pp 377–418. (1991) Allosteric antagonists of the muscarinic acetylcholine receptor. Biochem. Pharmacol. 42:199–205. (1995) Allosteric modulation of muscarinic acetylcholine receptors. Trends Pharmacol. Sci. 16:205–212. Nedoma, J., S. Tuček, S. Shelkovnikov, and A. Danilov. Allosteric effects of gallamine and alcuronium on muscarinic receptors, in Synaptic Transmitters and Receptors (S. Tuček, ed.). Academia, Prague/Wiley, Chichester, 108–112 (1987). (1990) Positive cooperativity in the binding of alcuronium and N-methylscopolamine to muscarinic acetylcholine receptors. Mol. Pharmacol. 38:674–680. (1995) Subtype selectivity of the positive allosteric action of alcuronium at cloned M1–M5 muscarinic acetylcholine receptors. J. Pharmacol. Exp. Ther. 274:1077–1083. (1995) Ligand binding properties of muscarinic acetylcholine receptor subtypes (m1–m5) expressed in baculovirus-infected insect cells. J. Pharmacol. Exp. Ther. 274:378–384. (1995) Allosteric binding of 9-methoxy-alpha-lapachone and alcuronium to the muscarinic acetylcholine receptor m2 subtype. Biomed. Res. 16:327–335. (1995) Positive and negative allosteric interactions on muscarinic receptors. Eur. J. Pharmacol. 291:427–430. (1995) Allosteric interactions between alcuronium and ligands binding to the classical binding site on cardiac muscarinic receptors. Life Sci. 56:1009. (1995) Detection, quantitation, and verification of allosteric interactions of agents with labeled and unlabeled ligands at G protein-coupled receptors: interactions of strychnine and acetylcholine at muscarinic receptors. Mol. Pharmacol. 48:362–378. (1995) Competition between positive and negative allosteric effectors on muscarinic receptors. Mol. Pharmacol. 48:696–702. (1996) Positive allosteric action of eburnamonine on cardiac muscarinic acetylcholine receptors. Eur. J. Pharmacol. 305:201–205. (1992) Novel functional M1 selective muscarinic agonists: synthesis and structure-activity relationships of 3-(1,2,5-thiadiazolyl)-1,2,5,6-tetrahydro-1-methylpyridines. J. Med. Chem. 35:2274–2283. (1994) Xanomeline: a novel muscarinic receptor agonist with functional selectivity for M1 receptors. J. Pharmacol. Exp. Ther. 269:271–281. (1994) Neurochemical effects of the M1 muscarinic agonist xanomeline (LY246708/NNC11–0232). J. Pharmacol. Exp. Ther. 269:282–289. (1989) Antagonist binding properties of five cloned muscarinic receptors expressed in CHO-K1 cells. Mol. Pharmacol. 35:469–476. (1994) Mechanisms of steric and cooperative actions of alcuronium on cardiac muscarinic acetylcholine receptors. Mol. Pharmacol. 45:709–717. (1994) Two populations of muscarinic binding sites in the chick heart distinguished by affinities for ligands and selective inactivation. Br. J. Pharmacol. 113:1529–1537. (1994) Protection by alcuronium of muscarinic receptors against chemical inactivation and location of the allosteric binding site for alcuronium. J. Neurochem. 63:1932–1940. (1988) Estimation of the affinities of allosteric ligands using radioligand binding and pharmacological null methods. Mol. Pharmacol. 83:187–194. (1976) The inhibitory effect of gallamine on muscarinic receptors. Br. J. Pharmacol. 58:323–331. (1983) Modification of the binding properties of muscarinic receptors by gallamine. Mol. Pharmacol. 23:551–557. (1985) Interaction of the neuromuscular blocking drugs alcuronium, decamethonium, gallamine, pancuronium, ritebronium, tercuronium and d-tubocurarine with muscarinic acetylcholine receptors in the heart and ileum. Naunyn-Schmiedeberg’s Arch. Pharmacol. 329:176–181. (1994) Assessment of the allosteric interactions of the bisquaternary heptane-1,7-bis(dimethyl-3′-phthalimidopropyl)ammonium bromide at M1 and M2 muscarine receptors. Mol. Pharmacol. 46:105–114. (1986) ‘Inverse agonists,’ cooperativity and drug action at benzodiazepine receptors. Trends Pharmacol. Sci. 7:28–32. (1995) Allosteric regulation of G-protein-linked receptors. Biochem. Soc. Trans. 23:108–111. (1986) Antimuscarinic and ganglion-blocking activity of neuromuscular blocking agents. in New Neuromuscular Blocking Agents (Handbook of Experimental Pharmacology, ed Kharkevich D. A. (Springer-Verlag, Berlin), 79:191–224. (1996) Activation of muscarinic acetylcholine receptors via their allosteric binding sites. Proc. Natl. Acad. Sci. USA 93:8705–8709.